A couple of years ago, Netflix entered the family sitcom arena with Fuller House, a sequel to TGIF’s Full House. For its follow-up effort in the space, the Internet network has picked up another family sitcom with TGIF pedigree. 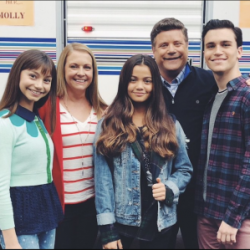 Netflix has given a 20-episode order to No Good Nick, a multi-camera comedy headlined by Melissa Joan Hart, star of the TGIF comedy Sabrina the Teenage Witch, and Sean Astin, in his return to Netflix after his memorable co-starring turn on the second season of Stranger Things. Created and executive produced by David H. Steinberg and Keetgi Kogan (Miss Dial), No Good Nick also stars Siena Agudong (Star Falls, Alex & Me) in the title role as well as Kalama Epstein (The Fosters) and Lauren Lindsey Donzis (Liv & Maddie). Hart and Astin play Liz and Ed, a hyper-competitive career mom and lovable but dorky “fun dad,” respectively, who unwittingly welcome 13-year-old Nick (short for Nicole) into their family of four before realizing she is a street-smart con artist with a secret agenda. The multi-cam sitcom, which has started production, has an added element of serialized drama as there might be more beneath the surface of Nick than meets the eye. The pilot and next three episodes are directed by Andy Fickman (She’s The Man) and produced by Netflix. It is the second multi-camera comedy series produced by Netflix, joining The Ranch.